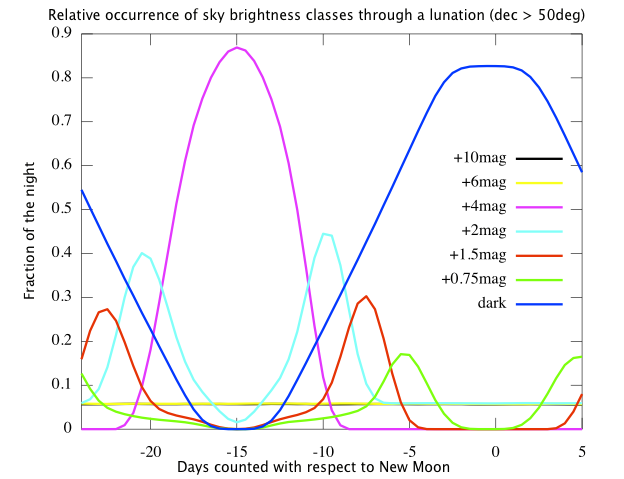 The table provides guidelines converting traditional phenomonological criteria to measured sky brightness scheduler classes. z' band is about one magnitude less effected. 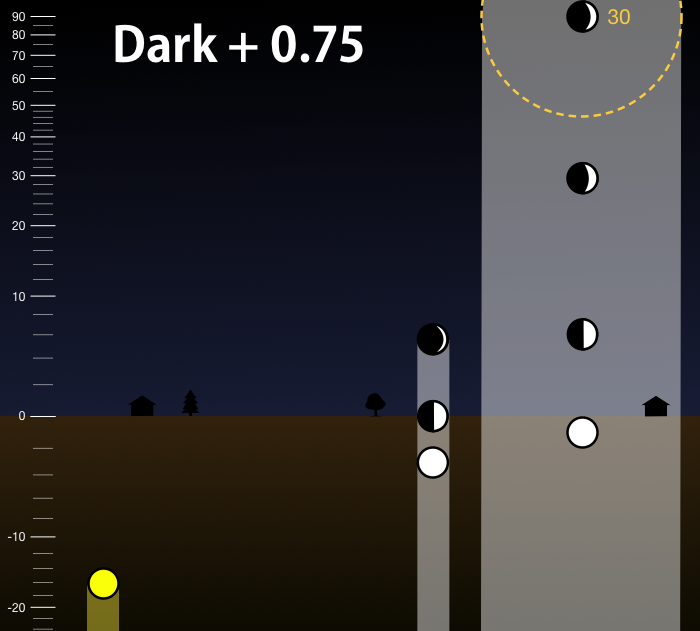 Note again that the criterion is expressed relative to the best possible dark sky in that filter. We are not saying the absolute sky flux in Vr'i' are all the same, only that in astronomical twilight, each is about two magnitudes brighter than it would be in full dark. As with all Observing Constraints, a group with no sky brightness set is completely unconstrained. I.e., you are happy to observe from the moment the Sun is below the horizon; perfectly legal, but not likely what you want. 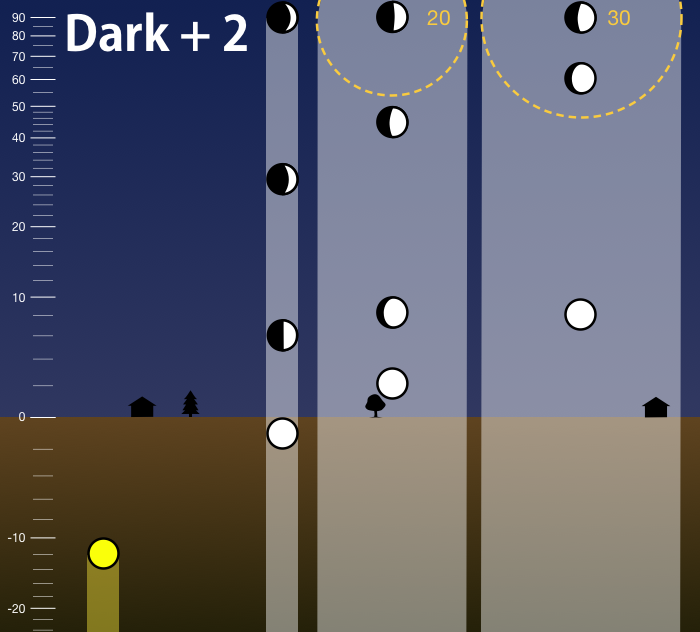 The precise amount of time available to observe any given target on any given night is dependent on both the target's and Moon's positions (RA,dec). It varies through the month as the Moon waxes, wanes and indeed moves. For high declination fields the Moon may never come particularly close to your target. The following plots have been derived by averaging simulations of three years of observing conditions for targets at a range of declinations. 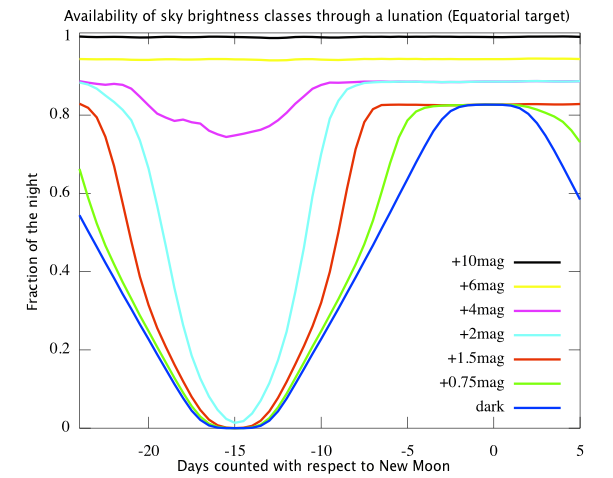 Scheduling is performed in terms of "observe whenever the sky is equal to or darker than the specified limit" and not "observe when the sky brightness is equal to the specified class" so cumulative plots are most important for deciding how likely your target is to be observed. Though not as relevant to the scheduler, plots of the differential distributions are also included below. Total cumulative availabilty of observing conditions averaged over a long time period. 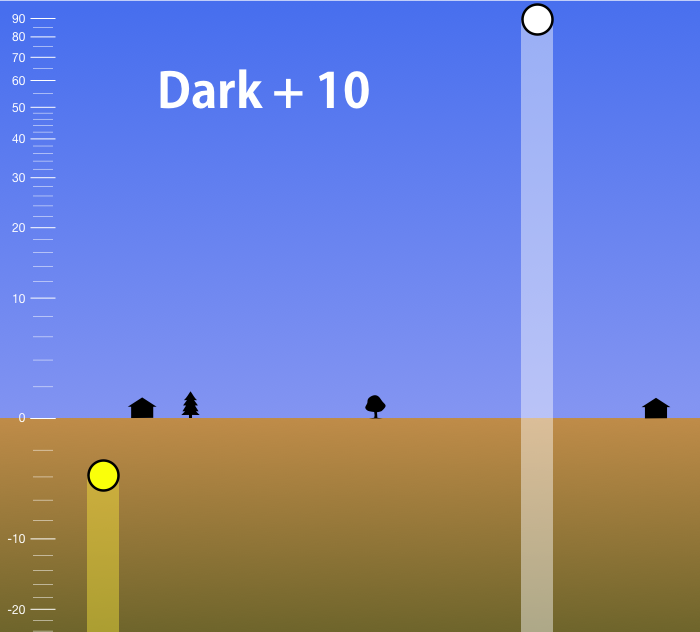 Roughly 40% of the time the sky is 'dark' whereas about 65% of the time it is equal to or darker than '2mag' which is what would traditionally have been described as 'astronomical twilight'. 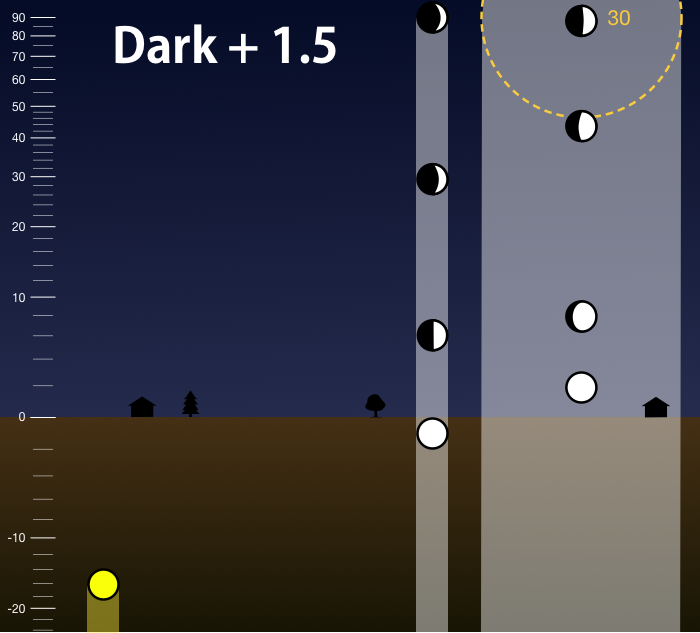 Plots illustrating how the availability of different conditions varies through a lunation. For a particular source in a particular month this plot can vary hugely. These plots represent an 'average month' derived from three years' worth of simulations. The greatest difference between the two panels is that for a high declination source, the Moon never gets close enough to push the sky into the '+6mag' class so the magenta '+4mag' line is determined entirely by twilight, not by Moon phase. 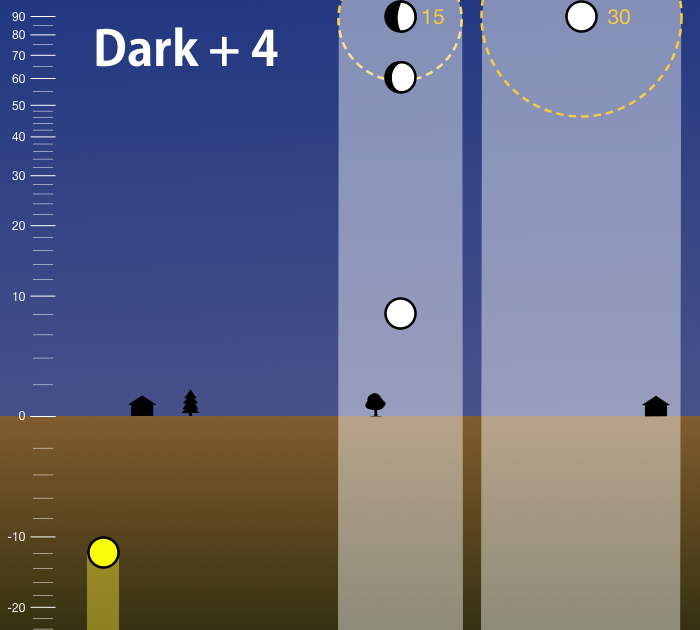 Plots illustrating how the availability of different conditions varies through a lunation, here plotting the amount of time the telescope would be in each class, not "in or darker than" the specified class. This plot is thus not directly relevent to the scheduler, but does make it easier to visualize how the sky brightness varies through the month. 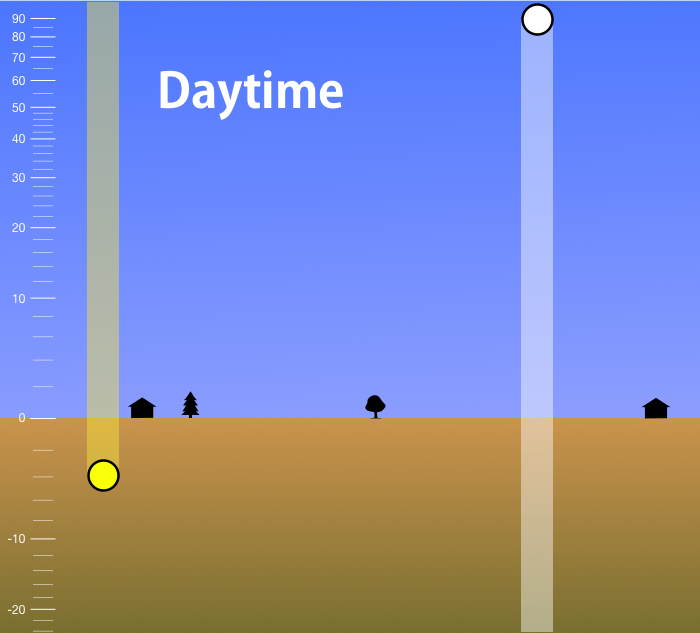 Take a hypothetical group that requests observations once every night but with no constraint on what time of night (i.e., a simple MONITOR with one-day period) and a sky brightness constraint of 2 mag. 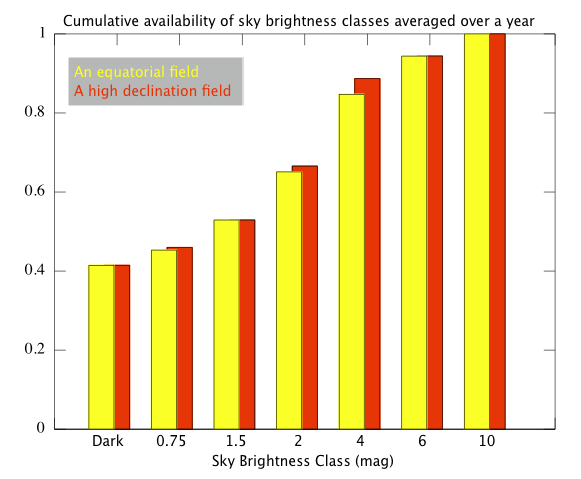 The red and yellow bar chart "Cumulative Availability of Sky Brightness" says that averaged over a year, 65% of all time is "2mag or better". This plot however says nothing about individual nights. As far as this plot shows there might be some amount of 2mag time every night and the specified group might in fact be done every night. Obviously some nights it would have more chance than others. 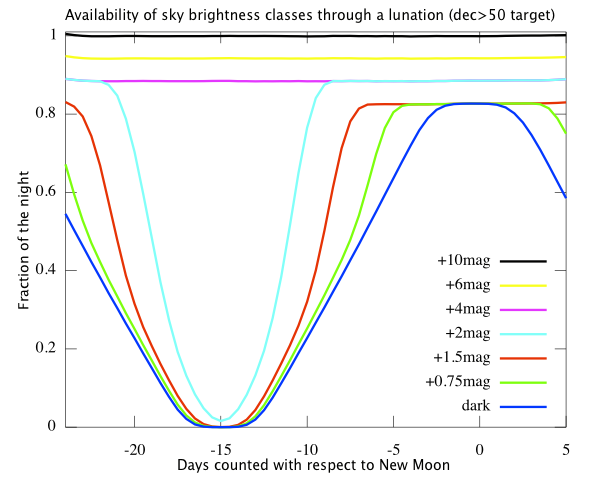 The the next pair of plots "Availability of sky brightness through a lunation" does show something about individual nights. This shows the availability on each night through a month as the Moon moves. The cyan curve is for "2mag or darker". You see that at full Moon there is essentially no available time and really there is hardly any "2mag" available about 2 - 3 nights either side of full Moon. Putting that together, about 65% of all time in the year is darker than 2mag, but there are 4 - 5 nights each month when there is very little and such a great is unlikely to be observable. Remember also that these plots are averaged for some arbitrary "typical" target Ra,dec. A target in the ecliptic will certainly have a few nights each lunation when it is completely impossible whereas a target far out of the ecliptic might have a small amount of time when it is possible every night. You see this difference between the equatorial and high-latitude plots above. 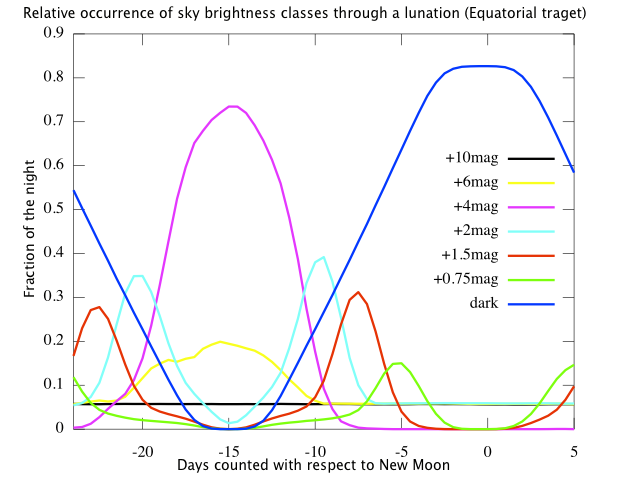 The equatorial one is much more strongly effected by the Moon in the 4mag (magenta) class. 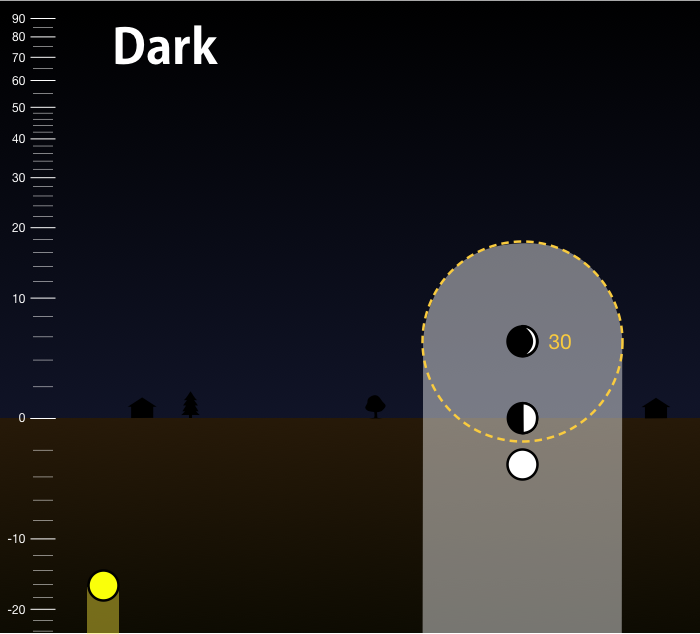 The Phase2UI allows you to explicitly choose from a list of various sky brightnesses in magnitudes The following pictograms illustrate what brightness setting would arise from various familiar observing conditions. 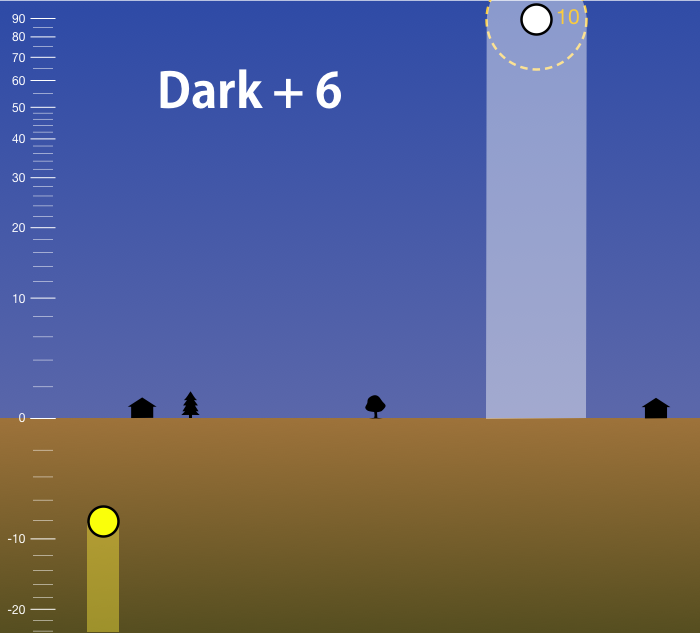 Effectively "Astronomical Twilight" or "full moon"
Effectively "Astronomical Twilight" or "high gibbous moon"
1° below horizon (or lower) & full phase. Effectively "Night & high half moon", or "low full moon"
Effectively "Night & high crescent moon", or "low half moon"
Effectively "Night & at most low crescent"